The display is corrupted when using unity-2d on a KVM. See attached screenshot. Thanks for the report Alex. Can you try any other Qt application in these conditions and see if they work properly? 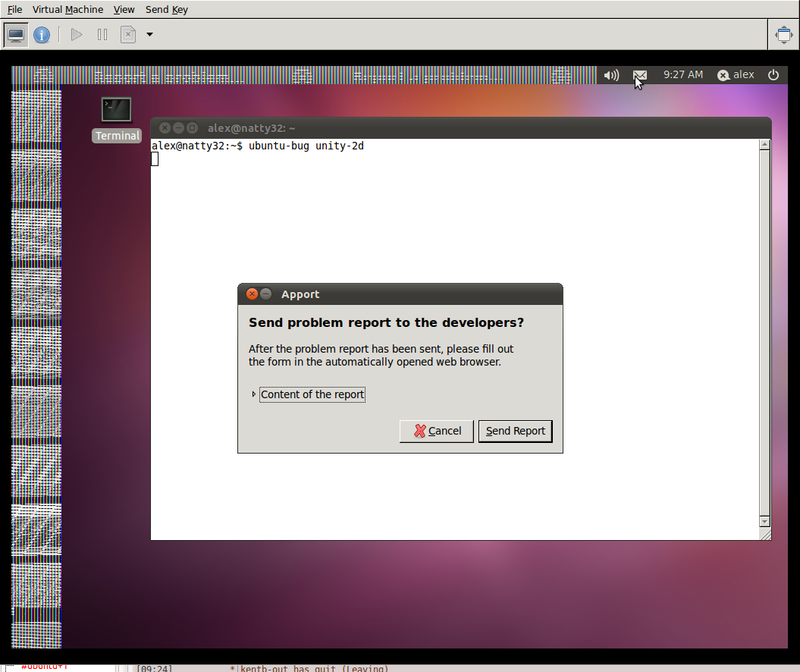 Using the cirrus video on 3.8.4.1-0ubuntu1 I get the same as shown in above screenshot. The left panel flashes in solid white or is invisible constantly if using the mouse within the VM, it calms down and ends up in the distorted state seen on cirrus occasionaly, screenshot attached. Ah, wrong of me, behavior described above was on "cirrus" as well, on "vga" both panels and gtk-eninge seems to work fine, similarly on "vmvga", on "xen" it simply won't boot for me. I can confirm that cirrus is busted and that vmvga works well with unity-2d. What I saw with the cirrus driver is similar to what I would see with konqueror in a vm, so this might be a qt bug. Subscribing the ubuntu-security team, since we use kvm extensively for testing VMs, and not having unity-2d as a fallback for unity 3d is a significant issue. 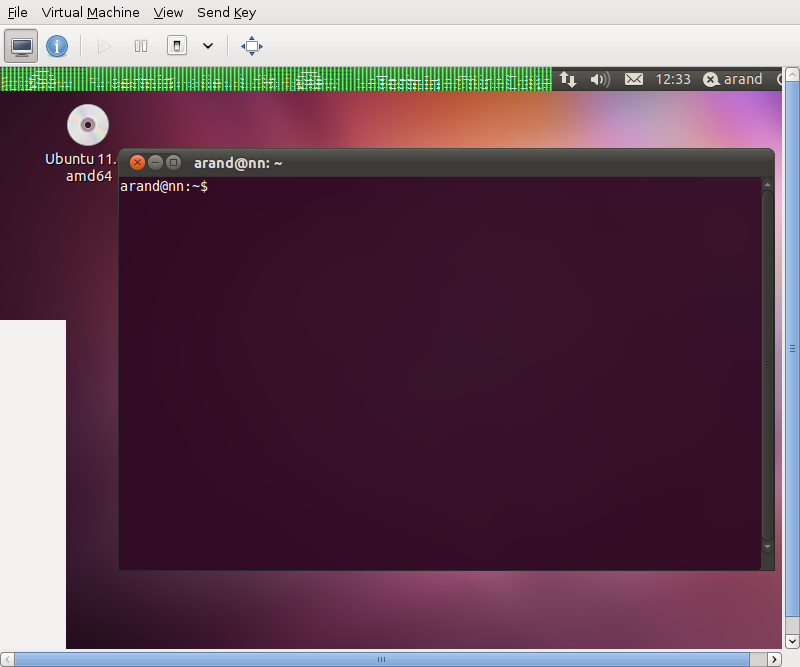 This bug is independent from 791133 (https://bugs.launchpad.net/ubuntu/+source/qt4-x11/+bug/791133). 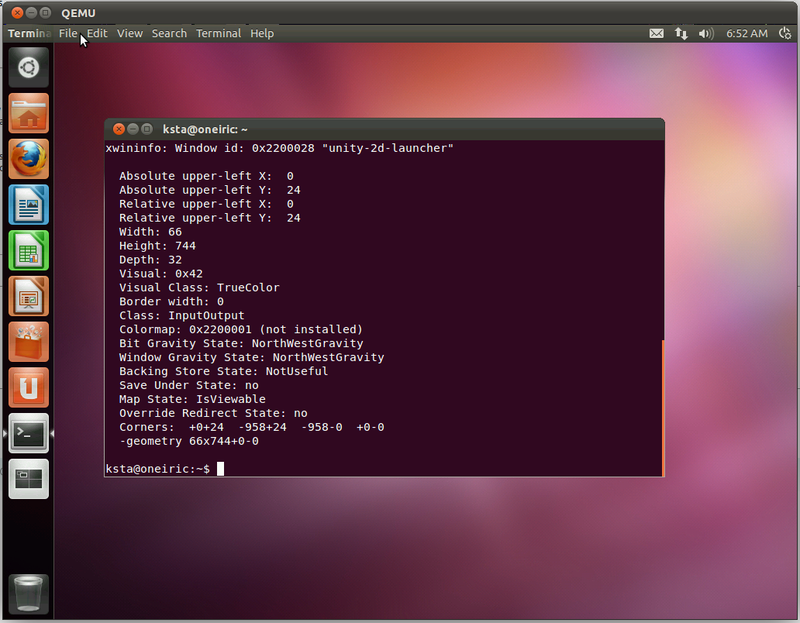 Bug 791133 is a bug in mesa (opengl) and unity-2d uses the "raster" graphics system. I have made some investigations, and I have almost found the bug. * QNativeImage::format() returns either 16 or 32 bits, but never 24! -> This is the cause of the garbage in the display. * QNativeImage::QNativeImage is called with the 32bit format, and allocates a Ximage (using XShmCreateImage) of the default (-> 24). * Result : QImage thinks we've 4 bytes per pixel, XImage 3 bytes per pixel and this is the source of the segfault. I have tried hacking QNativeImage::format() to return QImage::Format_RGB888, there is no more segfault, but the red and blue channels are inverted. format, or should we go away and use the vga emulation? I'm using Kubuntu 11.04 and am getting some really similar glitches with normal (effects-enabled) KDE (not 100% reproducably, though). 24bpp is a really common value for all the machines I used in the last 8 years (X has been auto-detecting this for years). This is physical machines I'm talking about, btw. IIRC, it used to be a pretty standard reply that 24bpp and 32bpp were essentially the same thing and, for some reason I never quite understood, X11 prefers the former. color depth and bits_per_pixels are not the same. pim@pim-virt-pc1:~$ xdpyinfo | grep "depth 24"
pim@pim-home:~$ xdpyinfo | grep "depth 24"
Can you please run this command? xdpyinfo | grep "depth 24"
I see. That must have to do with the part I failed to understand. I was able to set 16bit depth. Things appear much better now. The status bar in the upper right now displays all the icons and gadgets, before it was just blank. The workspace switcher displays correctly. I should mention that my previous comment about 16bit depth was while testing the cirrus graphics card emulation. The version of the X server incremented recently causing a minor change in xdpyinfo output. Attached is a current copy of xdpyinfo from KVM/Qemu guest running with cirrus graphics emulation in 24bit mode. When my KVM/Qemu VM guest is run with cirrus graphics emulation in 24-bit color depth mode none of the screenshots attached to this ticket look like what I'm seeing. The attached screenshot shows the unity-2d-launcher icons are displayed correctly but it overlaps the menubar at the upper left because unity-2d-panel is not displacing it downward. The upper left of unity-2d-panel does not display the status icons, calendar, etc. When I try to get the unity-2d-spread workspace switcher to open nothing happens to the screen while in the process table unity-2d-spread starts running. Then the segmentation fault mentioned in LP: #843448 occurs. This appears to have been fixed today.